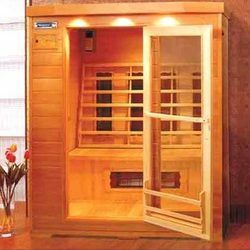 Our product range includes a wide range of sauna steam rooms, infrared sauna, sauna house and steam sauna cabinet. 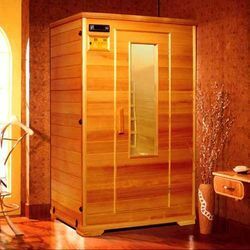 We have with us a quality range of Sauna Steam Rooms that is cost effective and used for steam bath. Available in 1300x1300x2100 mm size, our range revitalizes sore muscles, stimulate circulation and provides relief from congestion, daily aches & pains. Our range is highly efficient and has gained acclamation for low power consumption and long functional life. Within the wooden paneling, the sides of these rooms are well insulated. 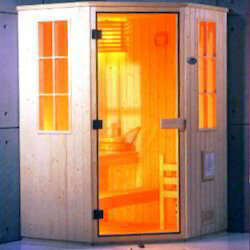 Available with us is a wide range of Infrared Sauna with wooden paneling. Equipped with special heaters which produce Far Infrared Radiations (FIR) focus on their rays on the user and warms him/her without heating up the entire room, results in better tissue penetration than the other saunas. It is ideal for the user who face breathing problem in a traditional steam heat sauna. Manufactured using imported basic quality material, these saunas are provided by us in1200 x 1000 x 1900mm size. We bring forth for our clients Sauna House -SP-1212, which cater to the needs of hotels and health clubs. By eliminating toxins through sweat, our sauna rooms nourishes & refreshes the body and improve blood circulation. Available in 1200x1200x2100 mm, these are energy efficient and manufactured using quality tested raw material to ensure optimum performance. 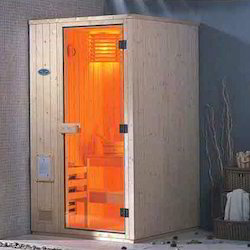 We are instrumental in manufacturing Steam Sauna Rooms-SE-503, which is available in 1520x1200x1900 mm size. These eliminate heavy metals and toxins from the body by opening up its pores. Manufactured using sophisticated technology, these are highly efficient and conforms to international quality standards.